cause was a big factor in their victory. Allied to the fact that they were on home territory. Even though the natives looked like them and spoke like them and were indeed English men and women, like them, the soldiers knew they were hostile. There they were lined up in the April dawn; a bunch of farmers armed with muskets and bravado, ready to take on the British grenadiers, the most professional army in the world. Amateurs. A shot was fired — from which side, it seems uncertain. 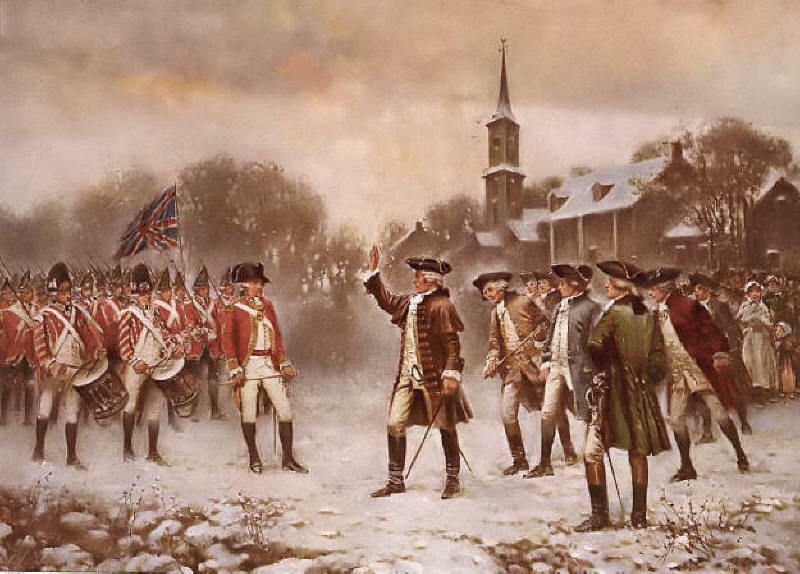 It was April 19, 1775 and the American Revolution had begun in a little town called Lexington, just outside Boston. On another April morning, the 12th, just over a century later, the new country declared war on itself at Fort Sumter in South Carolina. Three-quarters of a million soldiers died in the American Civil War. No one really knows how many civilians lost their lives. Yesterday, April 15 was Patriots’ Day in Massachussetts, a holiday in memory of those first revolutionaries in Lexington. At least three people were killed in a bomb attack at the marathon. April 19, 1993, 72 people died at Waco in Texas in a fight with federal agents. April 19, 1995, Tim McVeigh detonated a bomb in Oklahoma City that killed 168 civilians. He chose the date to commemorate the Waco deaths. April 16, 2oo7, Virginia Tech. There have been so many other mass killings of civilians in America on other dates that it would be stupid to draw too many conclusions from the coincidence of these dates. Not only that, most Aprils pass off quite peacefully. However, there is an astrological point here. Only one heavenly body is going to be predictably at the same place in the sky on the same date every year, and that is the Sun. Every year, give or take a few minutes, from April 12 to April 2o the Sun moves from 22° Aries to 29° Aries. That means the transiting Sun simultaneously squares the US Pluto in Capricorn and sextiles the US Moon in Aquarius during this week. These two planets are both at 27° in the Sibley chart for the US, which is the most commonly used. The exact transit takes place on the 17th. If you use other natal charts for the US, the sextile to the Moon might take place a day earlier or later, either way it is well within orb. Pluto is among other things, the planet of cruelty and violence — and also in a mundane chart, secret societies, underground movements. That egalitarian Moon in Aquarius represents the American people, the general public, innocent bystanders. These planets in the natal chart are tentatively connected by semi-sextile, which is a weak aspect. But when the Sun aspects both of them by transit, they connect up. Not normally a problem, except when you have more aggressive planets involved. For example, Mars, the planet of bloodshed, is currently conjuncting the Sun. Mars is more powerful than usual in Aries because its his own sign. In the Sibley chart, transiting Mars and the Sun are in the fourth house, which rules homeland, territory, the mother country itself. Aries is about beginnings and battle, so it’s not a surprising that hostilities in both the Revolution and the Civil War kicked off in April. The amateurs won the Revolution. Let’s hope the professionals win this battle. Thanks, Christina. I was wondering if there was some connection. My boyfriend’s birthday is the 19th and he of course has noticed all the violent things that have happened on his birthday (although I trump him – my birthday is 9/11). We’re in Boston, were at the site of the 2nd explosion just an hour earlier yesterday then came home to rest (he lives 2-3 blocks away). Heard/felt the explosions and saw the smoke rising. It’s heartbreaking. Always such a wonderful event, and yesterday a beautiful day. The magnolias are just opening all along Commonwealth Ave. Just so sad. I am glad you are safe though. “Amateurs,” as I am sure you know, means those who are motivated by love (amore). Professionals are motivated by many things; in our modern economic case, our economic system is designed to make profit the big motivator. We are all globally drowning in the willingness of professionals to use violence to secure profits, with the private corporate militia — a very Aries – Mars phenomenon — leading the deadly profiteers. We need more motivation by love, more courage in our hearts, to stand up for freedom and keep on proving the US Framers right, that no mortal power on earth can take away the inborn, god-given desire for thriving, joyful existing. That seeking happiness is unalienable. That is the work and the courage of amateurs, those who will not let our hearts be broken by the cynical cruelty that passes for power in the world, or the sociopathic, non-living corporate ‘human’ who has more rights under the current corrupted legal system than actual living persons do. So, no, emphatically so. Let us NOT hope the professionals win. America needs its patriotic amateurs, courageous lover of freedom and true joy, more than ever. She meant that the Revolutionaries were not a professional army, professionally trained. As well, the Redcoats would have seen them as amateurs. According to the redcoats, they were “only” farmers, thus, the redcoats would have though, how on earth would they fight a well-trained army? I want the professional police to find the Boston bombers and the professional courts to bring them to justice and the professional jailers to keep them behind bars. Christina.on a BROADER scale the amateurs NEED to WIN this one or we ALL go down. Boston Bombing was atypical of the broader struggle. Boston Bomber Brothers DO NOT represent ME or YOU, nor do they represent the Establishment/Govt./Police etc. ……….If they represented truly the battle of freedom (ie) Battle of Lexington, they should have been bombing the headquarters of Monsanto Corp, NOT innocent runners. There is NO comparison here MimiK is correct! I don’t see the world in oppositional terms like that. There is a place for everyone. Sometimes we need amateurs and sometimes we need professionals. Who says the Boston Bombers “represent the battle of freedom”? Not on this blog. The point of this piece is that violence happens in the States under certain astrological aspects. It may have a useful end – e.g. the Civil War and the abolition of slavery – or a crummy one – e.g.. the murder of Lincoln. Either way the them is violence, not right and wrong. I wonder, Xtina, would this work for family rows? You know, if you could make a chart for a family (how would you do that, exactly? ), could you then plot when families fight, and if that follows some sort of pattern? You can actually make a composite chart for your whole family which works astonishingly well! I think you might even be able to do it on astrodienst. you mean you can add several members in one composite? wow! yes, you can do groups, and it does reveal the inner dynamic and purpose. Thanks for this – didn’t know you could do it and have just tried on astrodienst “multi-composite” for me and my 3 children. Interesting result, wasn’t sure what to expect and will take some thinking about, but composite north node is exactly conjunct my sun… feels right. Quite interesting! Now with the Scorpio rising (from your latest post) all that Aries energy would fall in the 6th. It makes more sense in the 4th, but the scorpio argument has some good points. And would probably explain the fascination that people here have with gruesome tv shows and news! I need to think about Scorpio Rising further & the next time I do a US story I think I’ll use both charts to see. Abraham Lincoln was also killed in April! He died on the 15th. Oh yes – how could I have left that out! P.S. I just wanted to add that at least two of those killings are – or were reported to be – a direct result of April 20th being Hitler’s birthday, celebrated by some of those killers.